I want you to take a good look at the picture above. Upon first glance, it looks kinda cute, right? 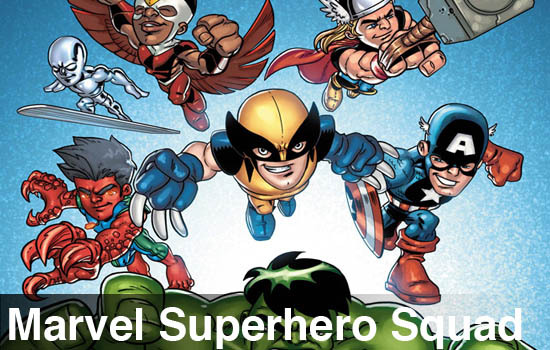 Shorty, super-deformed versions of classic Marvel heroes are absolutely adorable. Who can help but smile at the sweet lil' Silver Surfer? Cap is cute too, and even Wolverine looks positively huggable. Now, count the number of fingers they have. WHOA! They have three fingers and a thumb! That's a bit disturbing. This swing of emotion, from the initial "awww how sweet!" to the eventual "Oh gross, that's abominable!" exactly describes the feelings I had while playing Marvel Super Hero Squad. It's clear that this game is made for those of the much younger set. Super heroes in general are very appealing for children, and yet most genre movies, TV shows, and comics these days are firmly in the PG-13 category. Super Hero Squad is Marvel's response to this, with a toyline, a TV show, and now even a video game for the little people demographic. The game has combos and special moves, but is essentially a button mashing brawler with platforming elements. It's a good game for kids to pick up and play. The storyline is actually quite entertaining. While there is the typical maguffin that must be collected in order to save the universe, each character has their own side story. Squeaky clean and simple-minded, these stories are funny and entertaining even for older players. 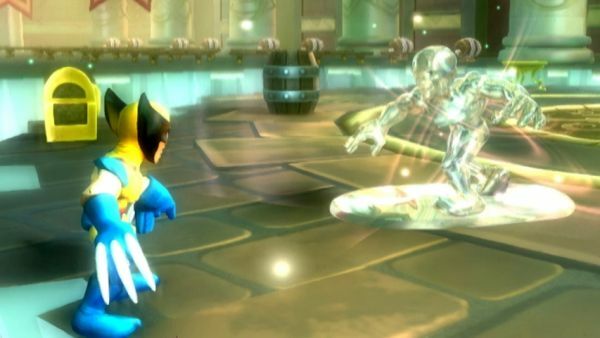 Wolverine's campaign deals with him looking for his stolen motorcycle. The best is the Hulk, who just wants some ice cream! For these campaigns, the main character is joined by a buddy, selectable from whichever heroes have been unlocked. I found myself wishing both heroes could be player-chosen, but it's not a big deal either way, really. Once the buddy is picked, a second player can grab a Wiimote and nunchuk and drop in and control that buddy at any time. It is in this co-op mode that the flaws in the game become horribly apparent. I can hardly believe issues like this made it through any sort of quality testing. Some of the design decisions are absolutely nuts, reminding me of game design circa 1985. Quickly, my initial favorable impression of Marvel Super Hero Squad turned into a teeth-gnashing rage, similar to that of an ice cream-deprived Hulk. The biggest culprit is the camera; it is atrocious. The entire game is played with the camera focused on player one only. Player two can run off screen, out of sight, and cannot do anything about it. This makes for some incredibly frustrating situations, as you can imagine. The camera swoops in and out, left and right, with dizzying speed, for no apparent reason. My son and I literally had to stop playing, at one point, as it was giving us both a headache. Page created in 1.7820 seconds.